Kidney stones are hard crystalline structures that are formed within the kidney or urinary tract while gallstones are hard lumps that develop in the gallbladder or bile duct. These stones differ in their position and composition in the body. Kidney stone patients are more likely to be men while gallstone patients are more likely to be women. Both kidney stones and gallstones are often asymptomatic until the stones grow too large, at which time the patient experiences excruciating pain. 1.1 What Causes Kidney Stones? 1.2 Why Do Gallstones Develop? Occurrence of Kidney stones is governed by a number of factors like dehydration, obesity, calcium supplements, diet, hereditary, age, digestive diseases, hyperuricemia, pregnancy and ethnicity (Asians and Caucasians have higher propensity). Occurrence of gallstones is governed by a number of factors like age, ethnicity (Natives American Indians have higher probability), obesity, crash diets, oral contraceptives, heredity, high fat diet, and statin drug. Kidney stones common symptoms include pain in abdomen, groin or flank. There might also be hematuria (blood in urine), nausea, fever and chills in case of infection. Gallstones are usually asymptomatic but in certain cases there might be pain below ribs, back and right shoulder, nausea, sweating, restlessness and fever. Gallstones vary in size and shape. They are usually small but can grow to be as large as a golf ball. The gallbladder may contain a single large stone or many small stones. 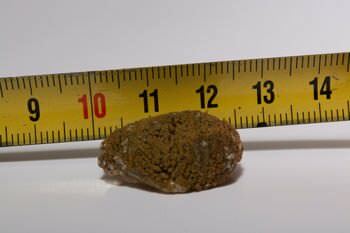 Kidney stones also vary in size. 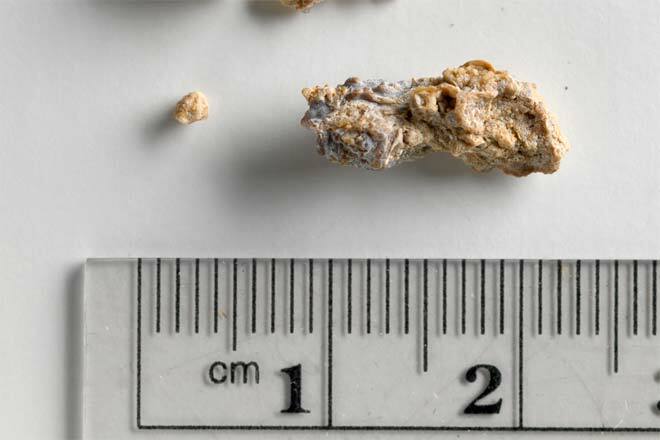 Once a kidney stone grows past 3 mm in diameter, it can obstruct the ureter. 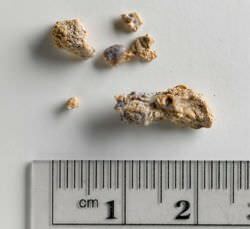 A vast majority of small kidney stones (less than 5 mm in diameter) pass spontaneously through urination. 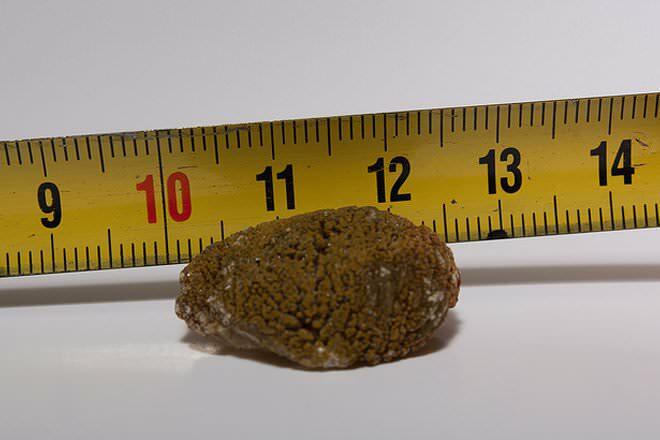 For larger kidney stones (5 to 10mm diameter), only about half pass spontaneously. The stones formed are usually mixed types with one predominant component from which they derive their names. Kidney stones are divided into 4 types: calcium stones, struvite stones, uric acid stones and cysteine stones. Cysteine stones are rare and found in patients suffering from cystinuria, cystinosis, and Fanconi syndrome. Gallstones are of 2 types: cholesterol gallstones and pigment gallstones (bilirubin). Pigment gallstones are common among people suffering from liver disease, infected bile tubes or blood disorders. Kidney stones are composed of minerals and acid salts. Gallstones are composed of cholesterol, calcium bilirubinate, calcium carbonate. Kidney stones can be diagnosed by CT scan, ultrasound and intravenous pyelogram. The medical terminlogy for kidney stones is Nephrolithiasis (from the Greek nephro- (kidney) + lith- (stone) + iasis- (process). Gallstones are diagnosed by CT scan, cholangiography, cholescintigraphy, blood cholesterol test, and jaundice. The presence of stones in the gallbladder is referred to as cholelithiasis (from the Greek chol- (bile) + lith- (stone) + iasis- (process). Kidney stones are treated by pain control medications, lithotripsy, inducing polyurea, and surgery. Gallstones are treated by cholecystectomy, ursodeoxycholic acid, ERCP, and lithotripsy. Surgical removal of gallstone does not cause any major changes in digestive process. Kidney stones can be prevented by drinking more water and avoiding food with high oxalate content. Gallstones can be prevented by controlling your weight, eating healthy (avoid saturated fats, sugar, carbs) and exercising. I have a kidney stone right now. I wanna shoot myself!